I spent the morning cleaning the boat. Better to do it at anchor than at the dock. 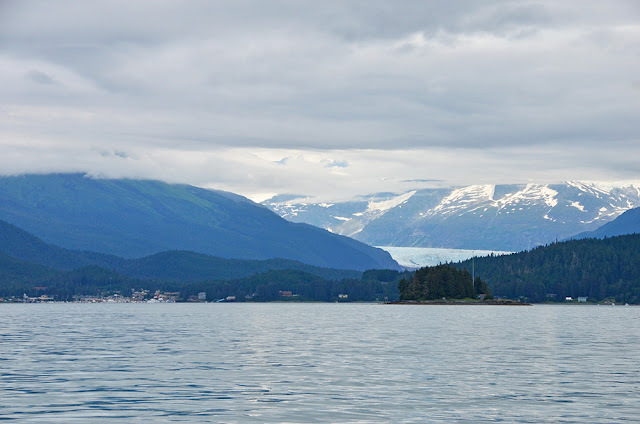 Then I headed for Auke Bay. Auke Bay is just a few miles from Juneau proper, but it’s thirty miles away by water. On Google Maps it looks easy to get from Juneau to Auke Bay via Mendenhall Bar. 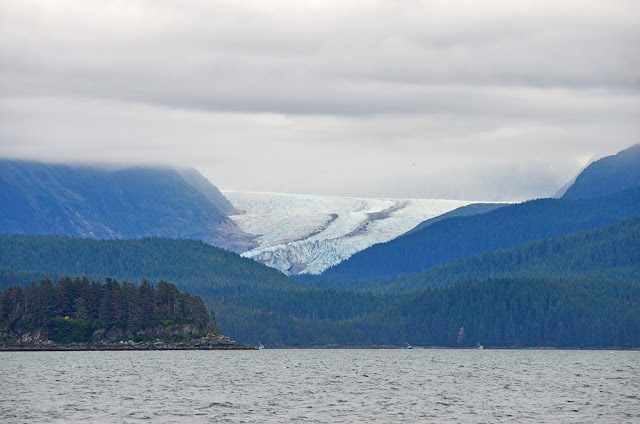 Unfortunately Mendenhall Bar dries at lower tides and isn’t navigable by cruising boat. So around Douglas Island we go. Approaching Auke Bay. Mendenhall Glacier in the background. A friend, also named Sam (the same Sam who accompanied me from Anacortes to Ketchikan in the C-Dory several years ago) arrived in the afternoon. After some grocery shopping we took a cab back to the boat. Our cab driver was terrible (one near miss in the parking lot, stories of running red lights to save time), but we made it to the boat and set off for points north around 4:00 p.m.
Lynn Canal has a reputation for being windy. Today it lived up to that reputation. We surfed northward with 20-25 knots of wind and 3-4 foot seas on the stern. The autopilot worked hard but kept us on course. With the seas behind us, we were pretty comfortable, and the groceries we’d left on the table only slid off a few times. We didn’t pull into William Henry Bay until about 8:00 p.m. The clouds hung low and mist sprinkled down. The guidebooks raved about the scenery, but we couldn’t see any of it. We dropped the hook between fishing boats in about 70 feet of water, made dinner, and got to sleep.